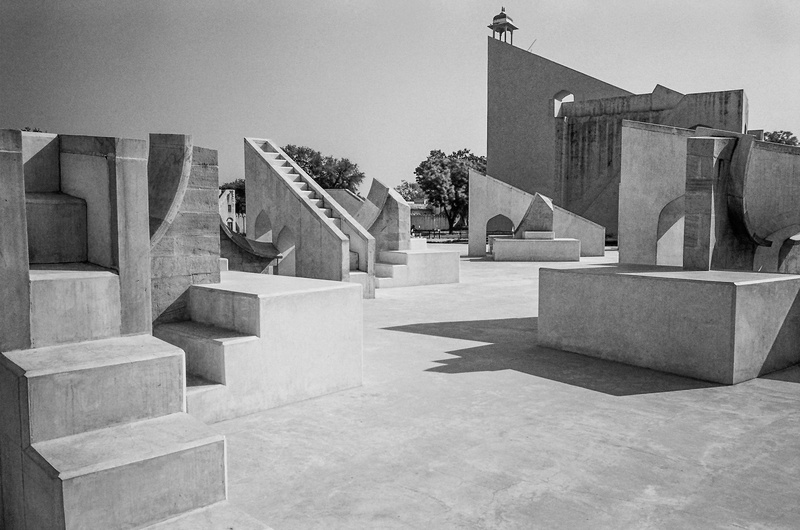 Deep in the heart of the pink city of Jaipur, there are a remarkable set of astronomical instruments known as the Jantar Mantar. Built in the early 18th century, these observational tools were designed to divine not only the movement of the stars and the passage of time, but more importantly the direction of one’s life. Jaipur was not only the first planned city in India; it was also a city where the future was expressed in geometry. Based on the principles of Vastu Shastra, Jaipur was designed in the form of an eight-part Mandala with streets and zones dedicated to certain professions and trades. Your time and place of birth determined not only where you lived, but also what you did. As I wandered through these meticulous instruments of fate, I kept thinking about how our ideas about the future had changed. In the industrial age, seeing the future was no more difficult than reading a manufacturing schedule. Like the rulers of Jaipur, business leaders could make detailed plans years in advance, as all you needed to do was to make projections based on a predictably changing environment. That’s not a luxury any of us have today. Can we hire some new talent to migrate our existing business models onto digital platforms? The problem is — when things really change, they don’t come from a predictable direction. Disruptive ideas and emerging technologies leak from one market to another, from customers on one side of the world to your own, or from completely different industries altogether. You don’t need a black swan to realize that the road ahead isn’t the future — it’s actually a form of tunnel vision. That’s why an app like Firechat, designed for San Francisco hipsters to exchange offline messages on trains, became the dominant communications tool in war-torn Iraq. Or why smartphones made by Apple or Samsung, built for teenagers and digital entertainment, overthrew established norms of enterprise technology. Prediction is fiction. The future is not what you expect. In fact, it’s what you least expect. The only way to stay a few steps ahead is by learning to see sideways. Seeing sideways is about engaging with disruptive ideas, interesting people and innovative companies that exist in markets adjacent to yours. These are the movements, innovators and technologies that have real potential to impact your industry and your business. It’s not enough just to take a casual look around every now and then. If you are serious about leading from the front, you need to make an ongoing commitment to shifting your vision. In other words, what you need is a personal observatory for the future, a 21st century Jantar Mantar that will allow you to divine not just the path of your own career, but where you need to take your company and team next. Identify the smartest people in your industry and stalk them on social media. Subscribe to the blogs of disruptive startups and technology companies using Feedly or Flipboard. If you start paying more attention to things happening on your periphery and the innovators outside your normal circles, you may also begin to notice clues relevant to your own future. Seeing the world differently is the first step to re-imagining it.